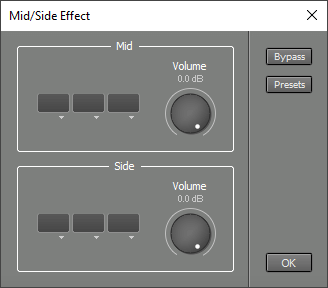 The Mid/Side Effect lets you apply effects to the Mid and Side parts. The incoming stereo channels (left and right) are converted to Mid and Side parts. Then any effects or level changes are applied. Finally the Mid and Side parts are converted back to left and right channels. The Mid/Side Effect can be used to correct problems in a full mix. In a typical pop song lead vocals and bass will be in the Mid part exclusively, while many backing instruments are in the Side part or in both parts. An EQ is the most commonly used effect. You can use it in the Mid section to EQ the lead vocals. You use it in the Side section to make the cymbals a bit louder without affecting the vocals, for example. Another idea is to use a Band Effect with a Dynamics effect in one of its bands, in order to make the vocals a bit louder or brighter etc. The Mid/Side Effect has no effect if the input signal is mono. Note: mid/side tricks typically come into play when it's not possible to redo the mix. Redoing the mix is often easier and better.